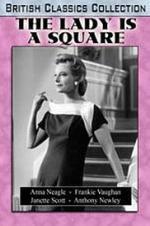 Buy or Rent The Lady Is a Square (1959) Movie DVD & BluRay Online! Movie Plot: Neagle stars a Frances Baring, a socialite widow attempting to keep her late husband’s symphony orchestra going. Reluctantly she enlists the help of a young pop singer (Frankie Vaughan) who has fallen for Baring’s daughter Joanna, played by a young Janette Scott.